There are two things that come to mind when reviewing the action of the markets: one is that markets do return to the trendline (either up or down and in this case was the uptrend line), and when a market wants to rally, it does so and ignores bombs exploding and banks imploding. This market currently is wearing global blinders ignoring reasons to see the dangers ahead. This behavior reminds us of a guy or gal wearing eye covers and walking along the edge of a cliff without falling. Eventually, not now, the markets as the blinded walker will slip and fall because they do not see danger. Perhaps not seeing the dangers in front of it has helped it maintain stability and sanity. Then of course, our markets are in much better shape than others and we are the best of the awful. ZIRP or zero interest rate programs have kept the dividend paying securities stable and is the safety net of this market. What has it done for the economy? We think, not that much. Many gurus are calling for a 10 to 12% correction in this market and compare this market to that of 1987. While we are a bit long in the tooth, two years without so much as a 10% correction, there is a huge difference between 1987 and today’s mildly frothy market. Today, interest rates are ZIRP and in 1987, interest rate on the three-month Treasury Bill was 7.19% in October of 1987 and had increased to that level from 5.3% in January of 1987. The 30-year Treasury Bonds began the year with an interest rate of 7.29% and by October of 1987 were yielding 10.25%. The US Dollar was falling. It certainly was a different time which also saw very low dividend yields on stocks. Today, we have ZIRP interest rates, high dividend yields and stocks with P/E that are not too high. There are significant differences between 1987 and today. We will have a correction and we agree that the longer this market endures without a correction the worse that correction will be. That said, the market will tell us when that correction will happen. When the corrections occurs it likely will be worse than anticipated. We remain a fan of non-interference by the Fed in the markets. We believe that cycles are necessary for economies to purge themselves of things that are really bad. Booms and busts are really a good thing and when not tinkered with, work well to filter out bad ideas and let good ones survive. To artificially play with those cycles causes stagnation, not expansion. A side effect of all this ZIRP is bubbles in the economy as well as out of control inflation, which isn’t being measured properly. Our government is encouraging corporations to take their incomes off shore to avoid the US corporate taxes. This is the consequence of ZIRP. How is this accomplished? Because the USA has very low interest rates, corporations are able to sell bonds that have relatively low yields. The corporations take this money and aggressively buy off shore companies that would add to their bottom line and give them a foreign domicile literally moving the income away from the US and to the merged company’s home domicile. By detouring the income abroad, corporations can bring that income back to the US after a while, at a lower basis and avoid the higher tax costs here. So where does that leave the American tax payer? Holding the bag, of course! Enough doom and gloom about the economy and bubbles for the US markets….. We had the occasion to travel to Disney World this past week. There we saw a marketing machine which is genius! Every ride, that we recall taking, dumped the rider into the specific theme related store. The only way off the ride was to walk through the store with the kids, who found everything wonderful. We were given the magic bands to wear which gained us entry to our rooms, the parks, rides and were keyed to a credit card so that you could just swipe your magic band to charge your credit card. Disney isn’t cheap, actually it is very expensive yet we saw masses of people standing on lines for rides, food, and snacks. Yes, middle of the road people spending their money of fun times at Disney, which, was awesome. We were impressed with the quantity of foreign tour groups at the park. As we rode the “Small World” ride we thought of Israel, Syria, Iran, Iraq, Ukraine, Crimea etc. Wish Disney were in charge of the globe at this point. The S&P 500 rallied in the Friday session closing the day above the uptrend line drawn from the April low. The market seems to be coiling and if this is true, should breakout to either the up or the downside on July 16 or so. The stochastic indicator and the RSI are both issuing buy-signals but our own indicator has not done so at this time. The 5-period exponential moving average is 1963.46. The top of the Bollinger Band is 1981.14 and the lower edge is seen at 1930.82. We are above the Ichimoku Clouds for all time-frames. We do have a mechanical sell-signal issued on July 8th. The retreat from the high posted on July 3rd has been very mild. That said we have areas of support at 1935, 1917, and 1891. 24.4% of last week’s volume occurred at the 1956 level. The 60 minute 0.1% by 3-box chart has an upside target of 1998 and a downside target of 1903.07. Currently we have a strong uptrend line in place on this chart. The daily 1% by 3-box chart shows a strong up trending market with an upside target of 2278.81. So far, this index has remained above the short-term uptrend line, that said, should we retreat further there are longer uptrend lines in place. The NASDAQ 100 rallied in the Friday session adding 25.25 points on the day. The 5-period exponential moving average is 3887.73. The top of the expanding Bollinger Band is 3942.35 and the bottom edge is seen at 3743.34. We do see a mechanical sell-signal issued on July 8th. We remain above the short and medium-term uptrend lines and below the downtrend line of 3901. We guess that should the market remain range-bound that there will be an explosive move on either July 21st or on July29th. This market is clearly in an uptrend and, although a hefty retreat was seen in the Thursday session, the uptrend line was not violated. The RSI, stochastic indicator and our own indicator all continue to issue a buy-signal. A different indicator, the CCI with a 5-period exponential moving average on that indicator is, negative. The volume this past week, has been in the normal range. The daily 1% by 3-box point and figure chart has absolutely no downtrend lines and an upside target of 3978.36. The market looks very positive on this chart. The 60 minute 0.1% by 3-box point and figure chart is equally as positive with an upside target of 3999.22. 25.5% of the week’s volume was seen at 3883 or so. 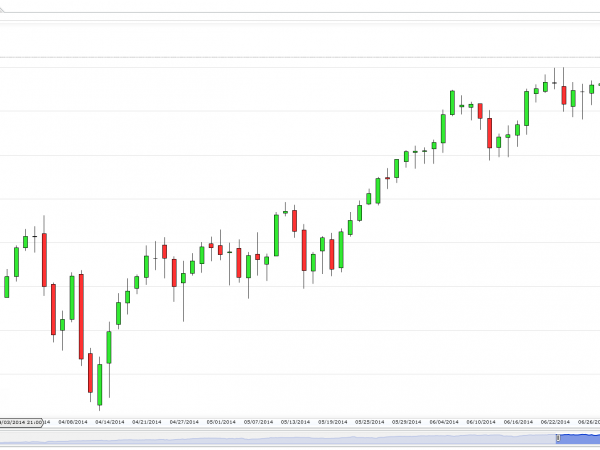 This market continues to look positive and has outperformed the S&P 500 this past week. 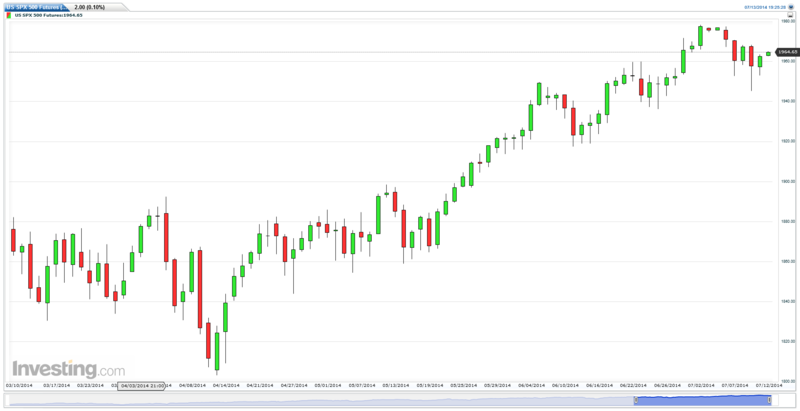 The Russell 2000 lost 2 handles, or points, in the Friday session and was the award winner for the weakest index among the financial indices that we follow herein. This is a wonderful example of what happens to growth stocks when the “risk on” button is pushed. None of the indicators that we follow are issuing a buy-signal but seem to be losing momentum on the downside. We did violate the short-term uptrend line and seem to have found some support at the horizontal 1140.40 line. This index remains above the Ichimoku Clouds for all time-frames. The decline has been too steep for it to continue at this rate and we do expect to see some backing and filling to stabilize this market. The 5-period exponential moving average is 1166.71. The top of the Bollinger Band is 1206.83 and the bottom edge is seen at 1151.31. Crude oil retreated in the Friday session ending the week with a huge slide cutting through several horizontal support line as though they didn’t exist. We closed below the lower Bollinger Band and slightly above the 100.31 horizontal support line. All the indicators that we follow herein are oversold and all continue to issue a sell-signal. The only exception is the CCI with a 5-period exponential moving average of itself which is just issuing a buy-signal. The 5-period exponential moving average is 1002.24. The top of the Bollinger Band is 108.06 and the lower edge is seen at 101.50. The down trending channel lines are 103.26 and 100.26. Crude oil remains inside the Ichimoku Clouds for both the daily and the monthly time-frames but is still above the clouds for the weekly time-frame. For the past three weeks, crude oil has been on a steep retreat, this past week being the steepest of the three past weeks. The monthly chart continues to show a range bound trading. While the shorter time-frames look scary for the bulls the monthly chart just looks like a market in congestion. The daily 1% by 3-box point and figure chart has an upside target of 136.38. The chart doesn’t look as awful as the market feels. The 60 minute 0.2% by 3-box does look awful and has a downside target of 99.23. Our horizontal support line is around 98 on the candlestick chart. We see nothing but downtrend lines on this chart which tells us that the bulls will likely feel more pain before this downdraft is over. Gold rallied in the Friday session and remains above the uptrend line and below the horizontal resistance line of 1346.80. All of the indicators that we follow herein remain overbought and positive. The pattern see, was a cup and handle pattern and it has played out as expected. We are above the Ichimoku Clouds for the daily time-frame and in the clouds for both the weekly and monthly time-frames. The 5-period exponential moving average is 1331.18. The top of the Bollinger Band is 1353.40 and the lower edge is seen at 1278.29. We have clear support lines at 1309, 1293 and 12665. We expect to see the market retest the uptrend line at 1322.88 and the horizontal line at 1309. The daily 1% by 3-box point and figure chart has an upside target of 1812.66 and a more recent downside target of 1113.19. The chart shows a market in consolidation. The 60 minute 0.2% by 3-box point and figure chart has an upside target of 1364.83 and continues to look extremely positive. This market will likely retreat to the uptrend line before it launches another thrust to the upside. The US Dollar Index spent much of the week cruising inside the upper limit of the trend channel and ended the week with a defiant break and close above the support line, closing the session at 80.23. We would like to see another close both above the top of this trend channel and above the trend channel created from this past week’s highs for us to begin seeing this as a run towards 80.62. On the downside, should this market pull back, we see 79.84 as support for the week ahead. The Bollinger Bands are turning inward with the Upper Band at 80.61 and the lower band at 79.84. The 20-period simple moving average is 80.23 (the current value of the index) and we are above the 5-period exponential moving average (currently 80.16). All indicators that we follow are currently issuing buy signals but again, we would want to see this index break above the top channel line drawn off of this last week’s highs. Turning to the weekly chart, this market continues to be in consolidation with 80.84 and 79.91 denoting this coming weeks support and resistance as per the triangle. Horizontal Resistance can be seen at 80.89 and support can be seen at 79.63. The 30 minute .05 x 3 Point and Figure Chart shows an activated downside target of 79.79 and an unactivated upside target of 81.45. There are internal support and resistance lines. Essentially, this is a market that does not yet know the direction it would like to break. All the market news and trend will be well guided by our company. If you any doubt regarding to Equity market them you just visit our company website.